That’s some good looking sourdough bread Ben. Thank you. I am somewhat self taught, and have made every mistake possible. My wife spent many years eating SD that tasted good, but wasn’t quite right in many other ways. Prime rib with a garlic/fennel/coriander rub. Smoked for an hour before cooking using a Breville Smoking Gun, and then another half hour whole resting before popping back in the oven at 500 for 10 minutes. Smaller roast (2.3 kg) so only took about 4 hours at 180 to get to 125. Could definitely taste the smoke on the outside. First time I used the Smoking Gun, excited to see where I ca go with it. Stir fried the courgettes and green pepper in my Mineral B country pan, which performed excellently. Leftover scalloped potatoes. Ben and Drew,you guys do a beautiful job.Oh how I wish I could bake and cook as well as you two.For now though,I sure love the temptations of your photos. Thanks! I used to always do prime rib on the bbq but have been using the method described in The Food Lab book for a while now. That, combined with a meat thermometer (I just use a cheap one from Superstore that stays in the meat as it's cooking), and a good rub, and you're off to the races. French onion soup with the ball and chain tonight. Chef Michael recipe, used a tawny port which I am polishing off now. Onions were in the pan a bit over 2 hours (a la the latest onion thread). Ciabatta bun from a local bakery. Used an age gruyere for the top. Spent too much on the cheese but it was delicious. First time I've ever made French onion soup and was way easier than I thought it would be. And turned out beautifully. Inspired by the onion post, I made zucchini and onions. I was alsoinspred by the onion thread, made chicken ketchitori again but with extra onions! I made chicken scarpariello last night for the first time, it will be a repeat. Had to google that one. Sounds like I'm gonna have to give it a try. Essential components seem to be chicken, stock, acid, peppers. Any tips after making it yourself? How about a lemon - dill Sockeye salmon with alderwood smoked salt. Lemon zest, dill and smoked salt under the broiler. Serve that over green beans sauteed in brown butter and tossed with toasted almond slivers. On the side some mesclun greens blueberries and feta cheese with a lemon - honey vinaigrette. I browned the sausage rounds (2 links each sweet & hot) in carbon skillet...removed them, left the grease and hit the chicken hard, when it was nicely browned, I did the veg. I couldn't get hot cherry peppers, so substituted pickled jalapeno...the acid was white wine, some juice from both cherry & jalapeno, plus a little red wine vinegar. After all browned, put in the roasting pan, poured the liquid over and popped in a 400F oven for 30 min. 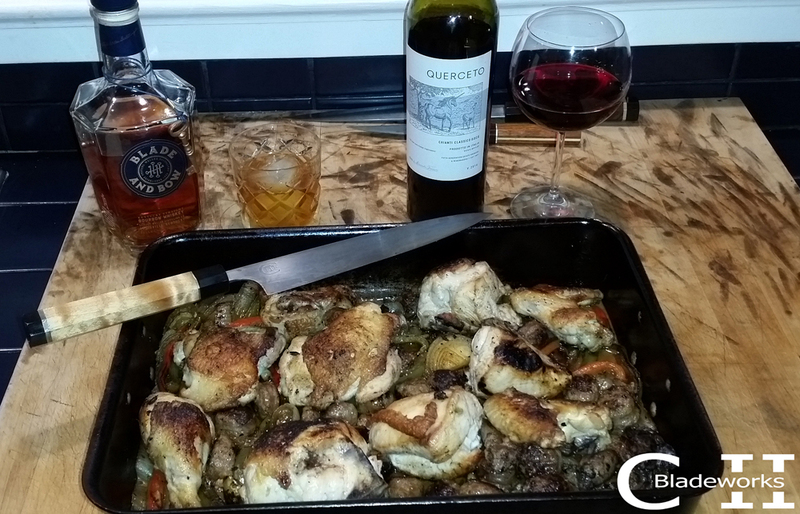 First time having Querceto...was on sale @ approx $13...think they had 3 different wines...would buy again, and will be interested to look at the other 2 offerings. Man that looks good. Perfect dish for this cold weather. Too bad neither kid would touch it. Crispy brussel sprout tacos with spicy peanut butter and a salty sour vinaigrette. Peanut butter from roasted peanuts and added red pepper flakes. Cooked 3/4 of the brussel sprouts until crisp, kept raw ones sliced like slaw. Vinaigrette was soy, Worcestershire, rice vinegar, scallions and ginger. Served over tortillas and garnished with cilantro, jalapeño, onion and avocado with a drizzle of lime. Here are some duck breasts that I scored with a Keijiro Doi White Steel #2 240mm Kiritsuke. I rarely use this knife and it was a treat to use and performed as expected. I am brining the duck in salt, honey, juniper berries, and thyme. After the brine, they will be air dried and browned on the stove and finished in the oven. I love duck, but my wife is not as enthusiastic, so I always enjoy it as a special meal. And how was the blade and bow whiskey ? I haven’t tried that one. This is my first bottle, I would buy it again. Not an all night drinker, but 1 or 2 drams, then something lesser. It is $45 here, so not too bad, but more than my daily drinkers. I have been a fan of bourbons made with Stizel Weller juice, so I was interested so see how this new bottle would compare. Also, I was totally in the dark regarding the pun of "Blade", Monica asked me if that is why I included this bottle in the picture with the knife.....that one passed me up...just a good whisky and good blade.